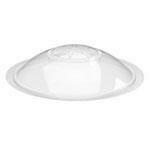 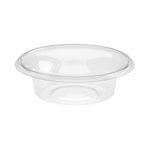 We offer a range of plastic bowls and lids ideal for a wide assortment of cold foods as they offer the unique "Press and Dress" feature. 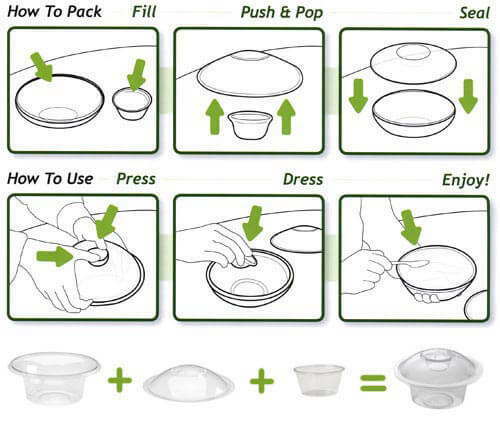 The bowls have been designed to be easily held in one hand so are perfect for food on the go and with the lid on can be stacked on top of each other in the fridge or chiller. 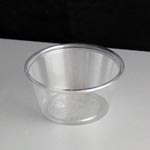 "Press and Dress" allows a small source pot to be store in the lid meaning wet and dry ingredients can be packaged together but kept separated to be combined later by the customer when required. 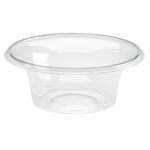 These containers are manufactured in the UK from crystal clear post-consumer rPET. 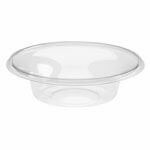 We also stock a range of circular hinged salad bowl in sizes from 250cc to 1000cc, click to view these products and prices.